Publisher: Henry, Holt & Co.
I’ll Meet You There was the first “5” star book I had the honor of reading in 2015. The story of Skylar Evans trying to escape Creek View, her dead-end hometown, and Josh an injured marine was compelling, honest, and a book everyone should read! I knew I was going to love this book the second Demetrios described the town of Creek View. It felt completely real to me. I could see the Taco Bell that Skylar’s mom worked at, smell the hot summer air, and picture the strawberry fields outside of town. The town itself became a character. Although the setting was fantastic what made this book so amazing were the characters. Skylar has just finished her senior year and is ready to leave Creek View behind but things conspire to make her reconsider. The story also explores Josh’s struggle to return to normal life after losing his leg and watching his Marine comrades die. I’ll Meet You There is about these two imperfect characters, each struggling to hold it together, falling in love with one another. It wasn’t just Skylar and Josh that I loved it the secondary characters also shined. Skylar’s best friends Chris and Dylan were well fleshed out. I loved how they supported Skylar but also told her when she was being a complete idiot. They were real, true, friends. Demetrios did a truly fabulous job handling heavy subject matter like PTSD and teen motherhood. It made me feel like the people in these situations were my own friends. She brought topics, not talked about enough in YA literature, to the forefront of the story and made them real. Overall, I adored this story. The setting, characters and issues felt utterly real. 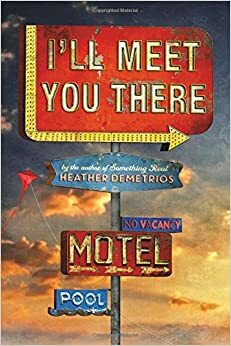 I’ll Meet You There has become my favorite book by Demetrios and that’s saying something because I really enjoyed both Something Real and Exquisite Captive! Thanks for this awesome spoiler free review! I just bought this book for myself. I can't wait for a break in my schedule so I can read it for myself. It is really rare that a book comes so highly recommended by so many people I follow. I love this book so much. I recently just finished it and I totally agree with everything you said. This book was stunning in terms of details. I connected to the characters so much and it basically came alive right before my very eyes. I ordered this book a few days ago because everyone seems to love it so much. I'm pretty excited to read it myself once I have it. Hopefully I'll love it also!